The beginning of a painting is always my favorite part. 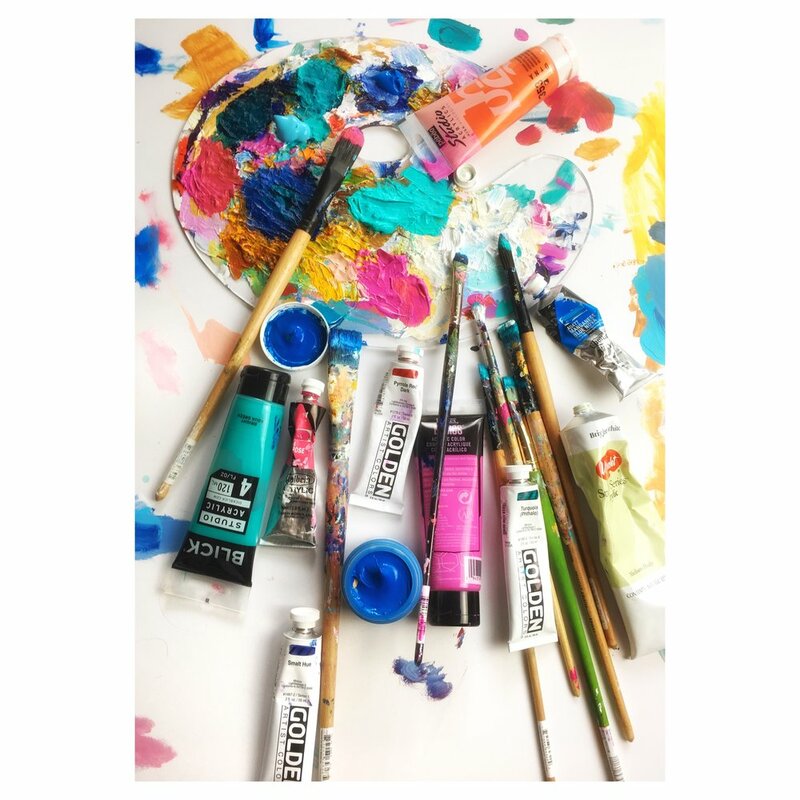 I crave the feeling of a loaded brush against a blank canvas- it's like this calming "woosh" that overcomes any anxiety and I'm in my element! From that point on it's just me and the stories I want to tell the world. Since I'm an abstract artist, I don't do any sketching or planning before starting. Although in the past I have, and every so often I will do a sketch, but rarely do I stick to a plan. I've found that my best paintings have been created by trusting my gut. At night, sometimes I doodle with sketch markers to unwind and sometimes my nighttime doodles turn into a loose plan for larger paintings, but overall I am an intuitive artist. The next step in my process is to put on music, something upbeat that matches my current mood. I have to be in my happy place to paint so typically I listen to something that makes me want to dance along to the music while I paint. Chances are, if I'm smiling and having a good time, my painting will also end up looking just as vibrant and fun! I generally like to take breaks during my day to quickly dance to a song- really lifts my mood! Because paintings take several layers and I have a small attention span, I generally break up my actual painting time with other activities in between or work on multiple canvases at a time to keep myself occupied. The highlight of my process is generally towards the end of creating a painting, when I get this feeling in my bones that makes me feel like my purpose in life is being fulfilled- because I've finished the story I wanted to tell and achieved my mission! Because my creative process is very colorful and unique, I decided to make a series dedicated to my story telling process and I thought it would be a cool way to share the experience with those of you who are following my journey. It's like a little piece of my journey from me to you! The Palette Stories is a collection of paintings and prints on paper of my stories told while color mixing for my paintings on canvas. I'm a storyteller, and I realized I was accidentally telling stories on my palette as well as on canvas and thought, well these are gorgeous too! You can have a piece of my new series for as low as $24.99. I'm really excited about this series! Thanks so much for taking the time to learn more about my creative process! Want to see more of me mixing paint and being my jolly self? Head over to my instagram for daily studio updates and certified goofy entertainment!